The Models 3025, 3026 and 3027 Piezoelectric Accelerometers are offered in a choice of sensitivities for general vibration and shock work. The internal construction of the piezoelectric seismic system ensures that the units have no discernible spurious response to mounting torque, body strains, cable vibration, cable whip, pressure variations and most heat transients. The sensor's stainless steel housing provides an environmentally rugged unit, while the epoxy seal offers protection against industrial environments. Its grounded case construction provides tight mechanical coupling which yields accurate, wideband shock and vibration data. 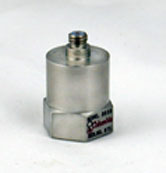 These accelerometers feature a 10-32 top connector and are provided with a 10" lownoise coaxial cable. High temperature units will operate in environments up to +500 Deg. F.
Consult the factory for customized versions of these sensors. Referenced to Sensitivity @ 100 Hz. © 2019 Columbia Research Laboratories, Inc.